Note: For the Armi Sport Sharps rifles you will need the: DB0500 1/2" Dovetail Block. Gunsmithing will be necessary on all applications. 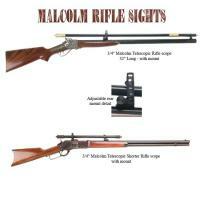 Included with sight: Tube locking mount for 3/4" Malcolm Long Telesopic Riflescope. Sharps heavy duty base.